Catch-up. Well, my good intentions of keeping up to speed with blogs didn't last long did they? I think I'll just give up on that idea and just plod along as per usual. After Sandspit Holiday Park our next stop was at the Uretiti DOC Camp located between Waipu and Whangarei and tucked in behind the sand dunes of a beautiful ocean beach. The Hen & Chicken Islands (centre & right) lie just off the coast in Bream Bay and Bream Head (left) forms a prominent headland and marks the entrance to the large Whangarei Harbour. The DOC camp is one of the larger camps we've visited on our travels, there's plenty of space for everyone to spread out with wide open grassed areas and smaller bays which you can tuck into if you're wanting to get away from it all. There's a one-way road loop around the camp; we drove around twice before we chose our site and for the first few days we had the whole section to ourselves. 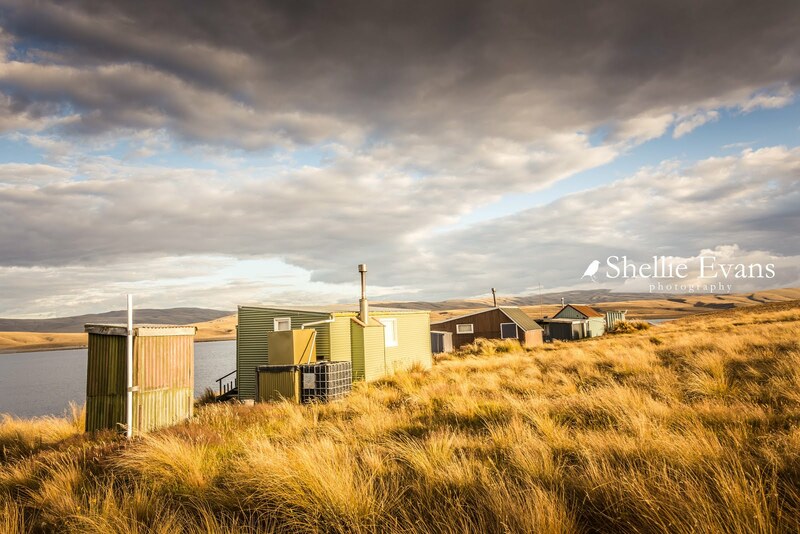 Once school holidays started, a few more campers arrived and many of them stayed at the other end of camp where the one hot water shower ($2) was located. There are also cold showers available at each of the toilet blocks. Our area began to fill too although we still had plenty of room. 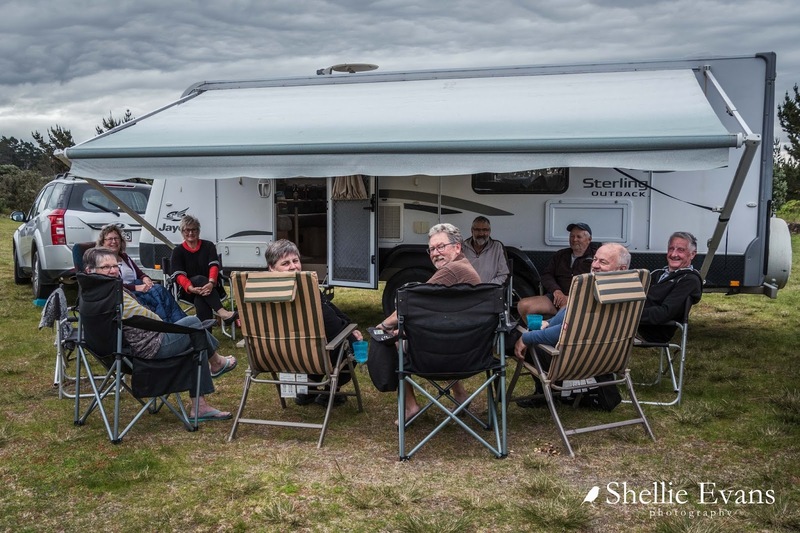 It was lovely surprise to see another fifth-wheeler arrive and find out that it was Jocelyn & Murray who also live on the road. 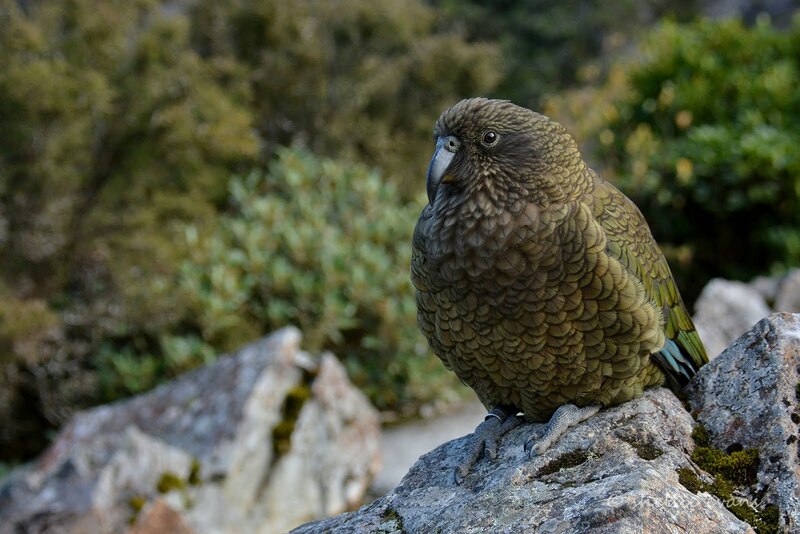 We'd last seen them at the NZMCA Park at Ohau B canal in Twizel a couple of years ago. 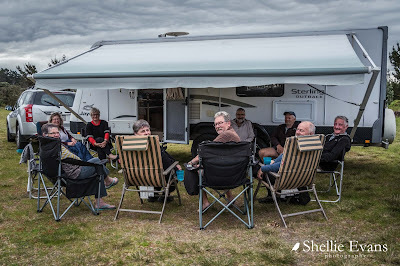 It was great to catch up with them again, and then their friends who also arrived and other RVers who decided they couldn't miss out on a few happy hour drinks too. It wasn't going to be the last time we'd see Joc & Murray either. ...that stretched for miles in both directions. 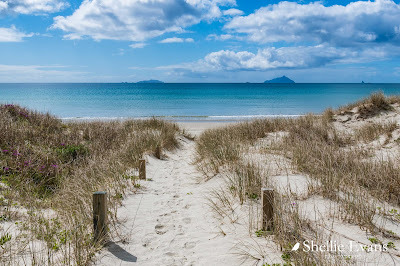 I walked towards Waipu one morning and had the whole beach to myself for quite some time. Well, almost to myself if you don't count a resting pair of Variable Oystercatchers/Torea Pango who didn't move a beak as I passed but kept a wary eye on me. And a pair of NZ Dotterels/Tuturiwhatu who also watched carefully, not wanting to leave the dead clam they were poking and prodding. 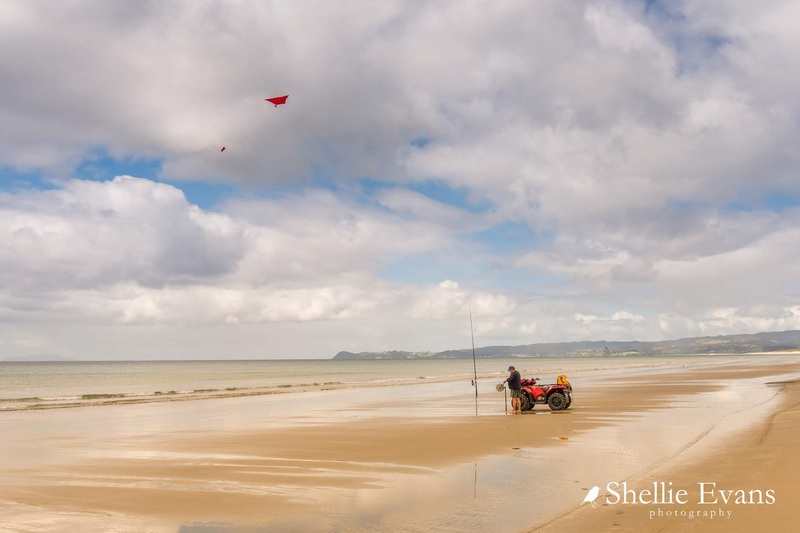 ...trying different ways of fishing. These guys had a Torpedo which is an electric long line that can send the baited line up to 2kms out to sea. After a certain amount of time the line is winched back in with hopefully fish on the end. I love the four gulls lined up above waiting for the by-catch. And this guy sent his line out by kite, he told me he preferred being able to feel his line (and catch) once it had been released into the sea from the kite. He wound it back in by hand. 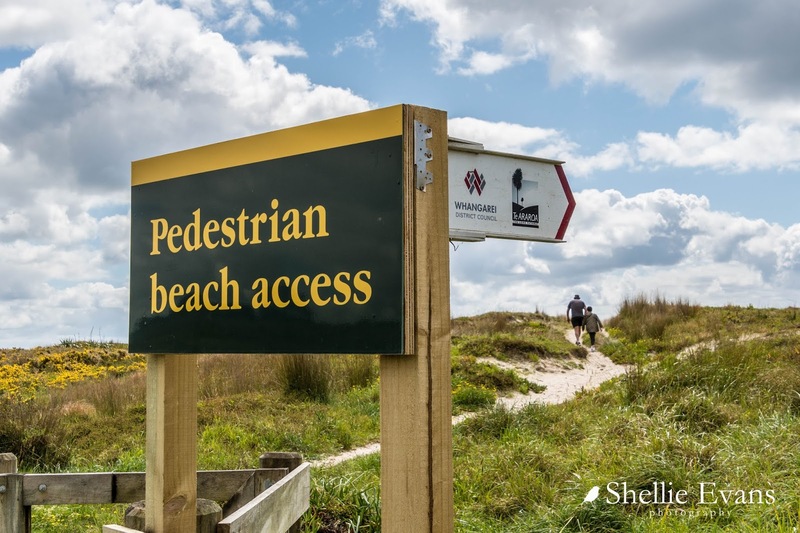 And there was that Te Araroa Trail sign once again. New Zealand's Trail, a 3000km walk from the top of the North Island to the bottom of the South Island (the Long Pathway). We haven't seen it so often in the North yet but criss-crossed it dozens of times in the South Island. We're doing the cheats trail, it takes a lot less energy but one hell of a long time! I also found this interesting creature with a vicious set of teeth on the beach. At first I thought it might be the remains of a sea snake but after a bit of research I've found out that it is actually a Sea Serpent or Serpent eel. 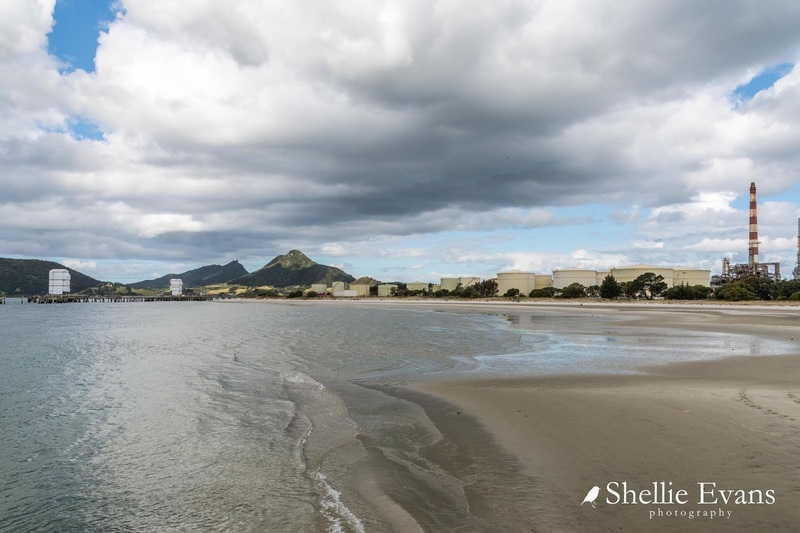 They are quite possibly the longest eel in New Zealand at an average length of 1.3m but can reach up to 2.5m in length. They live underwater in sand burrows with just their heads poking out waiting for food to swim by. They very wary critters and divers report that they are hard to get close too. They are fast movers and disappear back into their burrows as fast as they can swim forward. 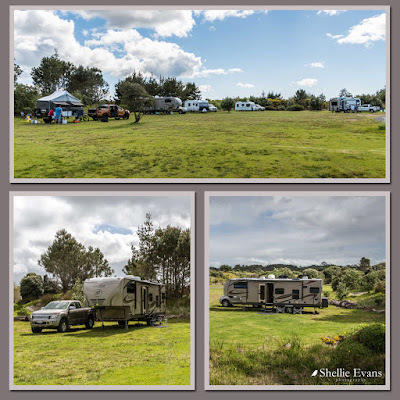 We spent most of our time at Uretiti relaxing in the early summer sun although we did manage a couple of days exploring north and south of the camp. 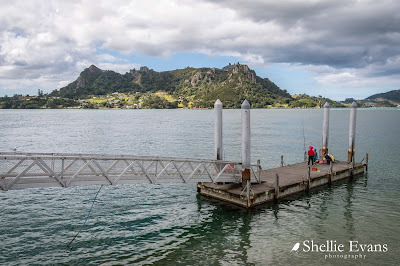 We visited the Marsden Cove Marina and wharf area where it was a surprise to see actually how close Whangarei Heads was across the harbour. It's no wonder some workers from the Marsden Point Oil Refinery boat to work each day from across the other side (including my sister's boyfriend many years ago), it's just a hop, skip and jump! 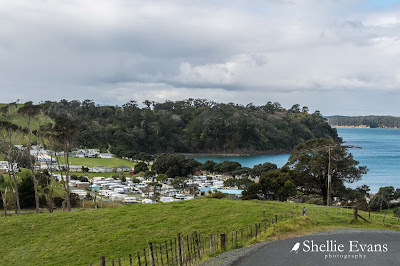 On our way home we drove by the local dump station at Ruakaka, checking to make sure access was ok for when we visited it later in the week (fellow big rig owners will understand this ritual). 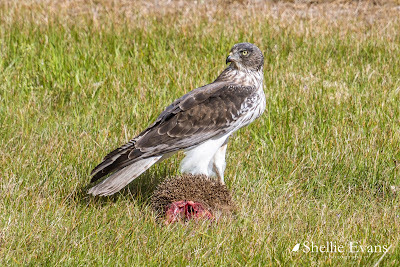 It was a thrill to spot this beautiful old Harrier Hawk/Kahu holding onto his road kill hedgehog nearby. Hawks are very shy and will usually fly off as soon as you approach them. Not this one though, he stayed on the edge of the road and we were able to turn around and cruise by very slowly as I took photos of him through the open window. He has stunning white 'underpants', something not often seen in a hawk. Did you now the lighter the feathers the older the bird? 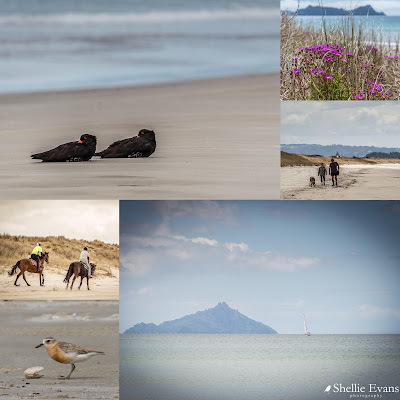 After lunch at Opahi Bay on the Mahurangi West side of the harbour, we drove back to Warkworth, back down Sandspit Road, past our turnoff, past Snells Beach and on along Mahurangi East Road. 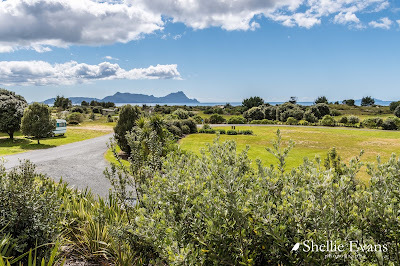 Then it was along Ridge Road twisting and turning through some magnificent homes with magnificent views until we finally arrived at Scotts Landing on the tip of a narrow finger of land, one of two fingers that make up the Mahurangi East Regional Park. We were just in time to see one of Bio Marine's barges arrive at the slip to offload. 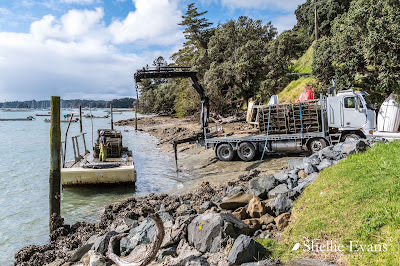 They have several oyster farms in the Mahurangi Harbour; you can see one (centre) in this photo I took from the other side of the harbour (click to enlarge). You can also see Scotts Landing at water level, on the right, on the other side of the water, 35kms by road away. These are Pacific Oysters and they are farmed in the inter-tidal zone of sheltered harbours and estuaries. 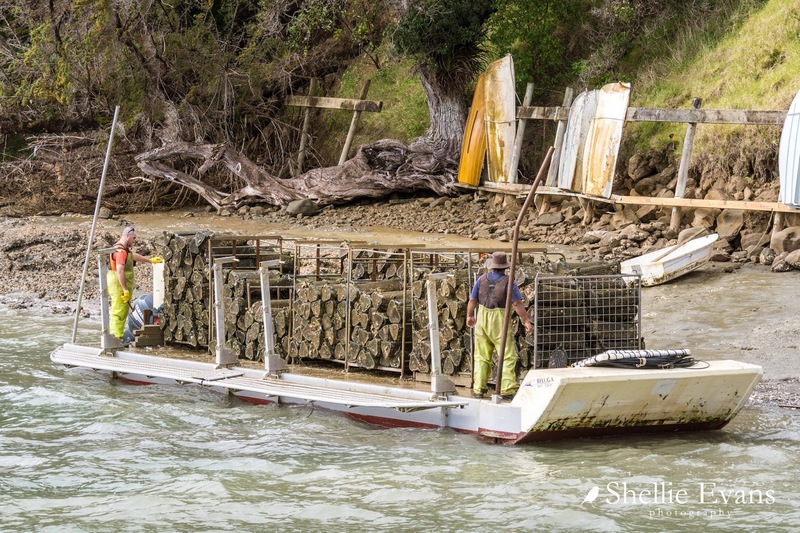 Two tides a day wash over the racks that hold the caged oysters. When they are ready to be harvested, the baskets are removed and taken back to the factory to be emptied, then they're cleaned and returned with hatchery spat inside them. Wild spat are collected on timber sticks in the summer months and the sticks are then attached to racks in the inter-tidal zone too. 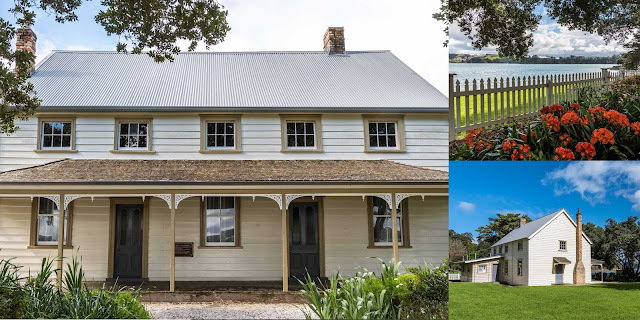 While David watched the unloading, I walked around the corner and along a short boardwalk to have a look at another magnificent historic homestead in a regional park. This is Scott Homestead (hence Scott Point) which was once the hub of the area. Mahurangi Harbour had a busy past with timber milling, ship building and firewood cutting trades. How's this for a view from your front garden? 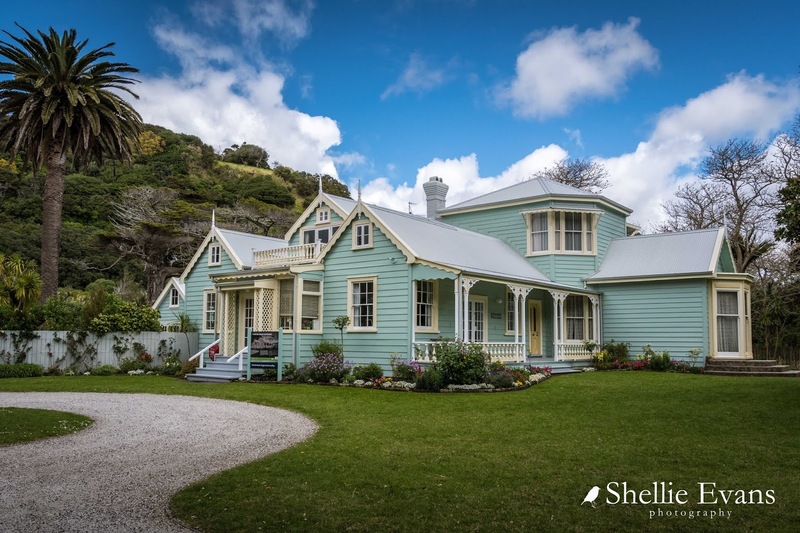 Thomas Scott Jr built the Georgian style house in 1877 on the site where his father, a shipbuilder, ran an inn until it was destroyed by fire. I just loved the colour of the clivias under the pohutukawas in the front garden. 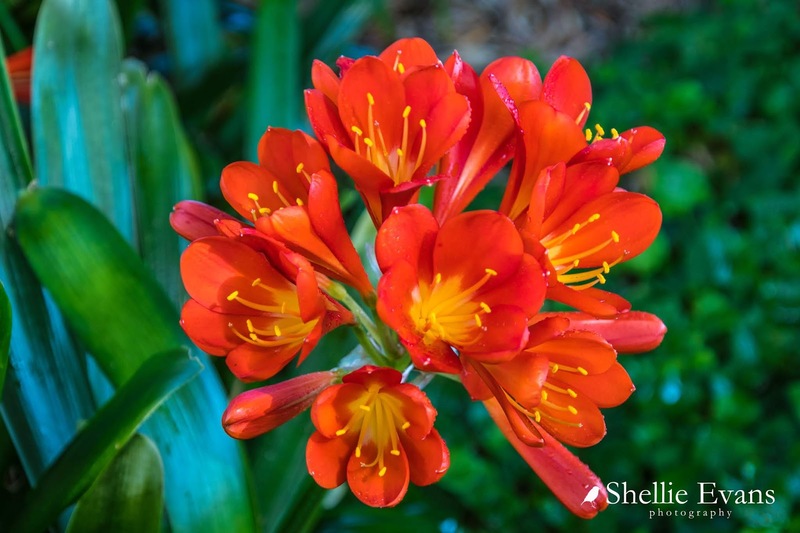 Being protected from the sun, they were a deep orange. From Scotts Landing we headed back towards home but not before I twisted David's arm to drive down to Martins Bay to check out the beach and the holiday park. 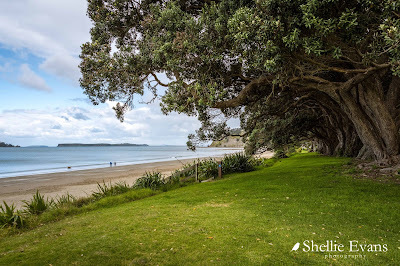 Martins Bay was another lovely east facing beach with a backdrop of huge pohutukawas; come summer and New Zealand's very own Christmas trees would be in full bloom, what a beautiful sight that would be. The large camping ground just about filled the bay with hundreds of sites, it's great to see that the casual camping sites are located on the water front (bottom right). There are rows and rows of permanent caravans, all tucked up for winter. This is obviously a very popular place in the summer. No doubt a few of them will be getting a good airing this coming long weekend. 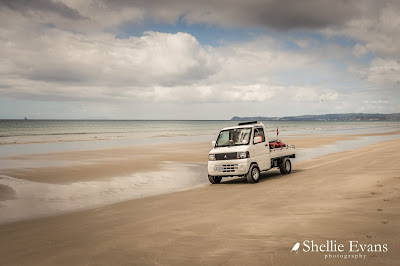 And then there was some more arm twisting to convince David to drive along the waterfront at Snells Beach to check out the two freedom camping sites; he was getting weary and thinking of home. 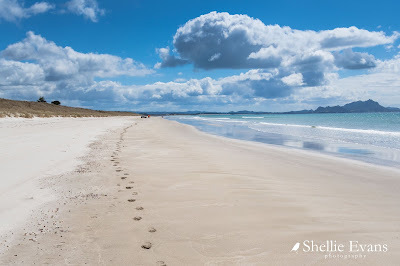 This is Snells Beach East where there's a 2 night maximum stay, it looks great but we'd only fit in at the far end otherwise we'd stick out too much for people to pass. 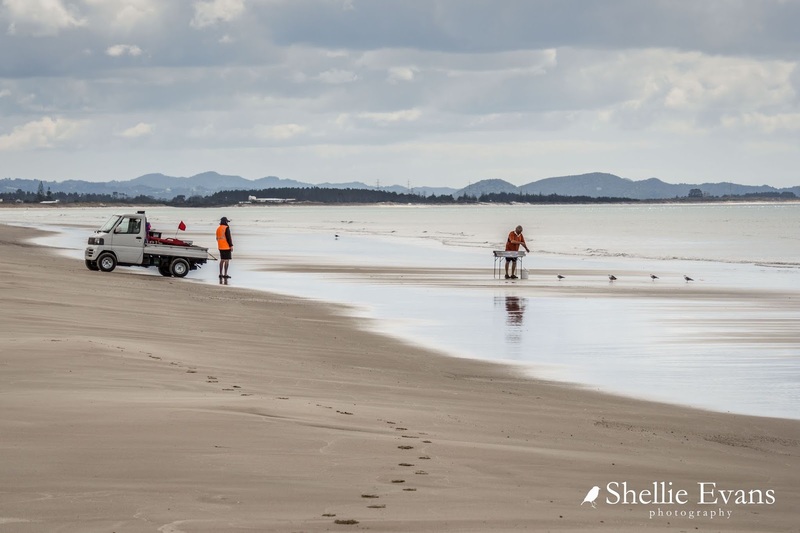 The Snells Beach West site looks to be the better one if we ever come back this way, it also looks like it may be a little quieter (allocated sites at the back of the carpark) with the added bonus of a boat ramp. 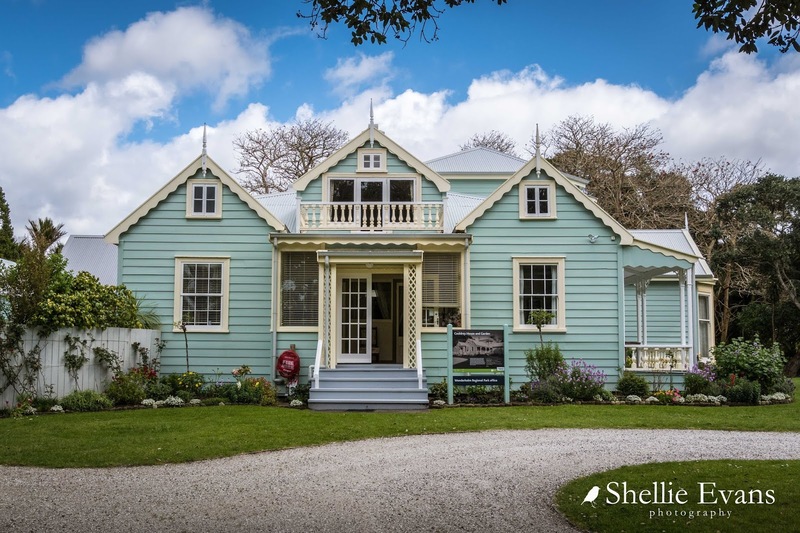 This also has a two night maximum stay. 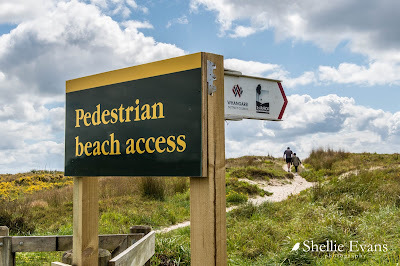 We had the next day off and then the following day (and our final at Sandspit) we headed north to check out the last of the regional parks in the area; Tawharanui which is located at the end of the Takatu Peninsula just south of Omaha Beach. We were travelling along a winding country road not too far from the end of the road when David suddenly exclaimed 'That's it!" as he pulled to a sudden stop. He had spotted his brother's old business 'Sandpiper Lodge', we hadn't seen it in over 25 years and we weren't exactly sure we'd recognise it or in fact if we were on the right road. We just knew it was in the general area. It's still a lodge but with a different name. 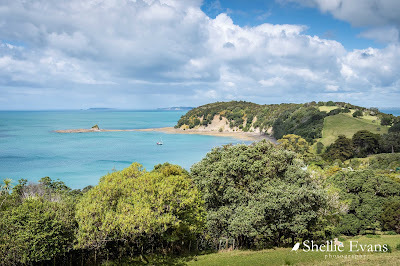 I remember the estuary that the grounds border, we did some bird watching along the edge and we spotted out first and only Kookaburra, a fairly rare Aussie import that hasn't spread much further than the North Auckland area. 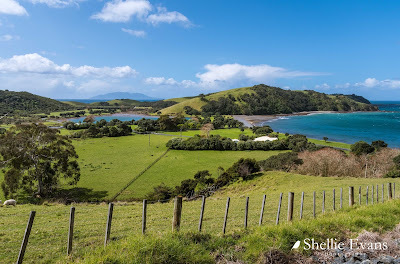 Finally after another short length of narrow and winding road we came over the top of a brow and there below us was Tawharanui Regional Park, another park, like Shakespear, that is protected by a predator proof fence. 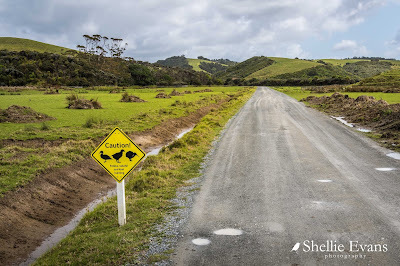 There's not many (if any) places in New Zealand that you'd see this sign cautioning drivers to the existence of three rare birds; Pateke (Brown Teal ducks), Takahe (a little like an oversized pukeko and very rare, they were thought to be extinct not too many years ago) and Kiwi. 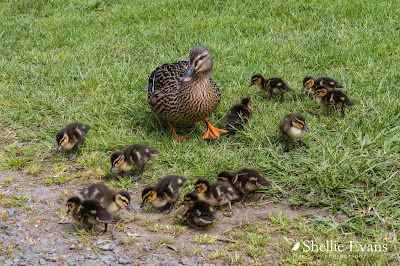 Unfortunately we didn't see any of them; not that we went looking any further than out the car window! 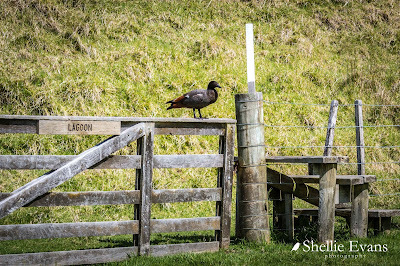 According to the DOC Ranger we spoke to, the Takahe are frequent visitors to the surrounding paddocks. 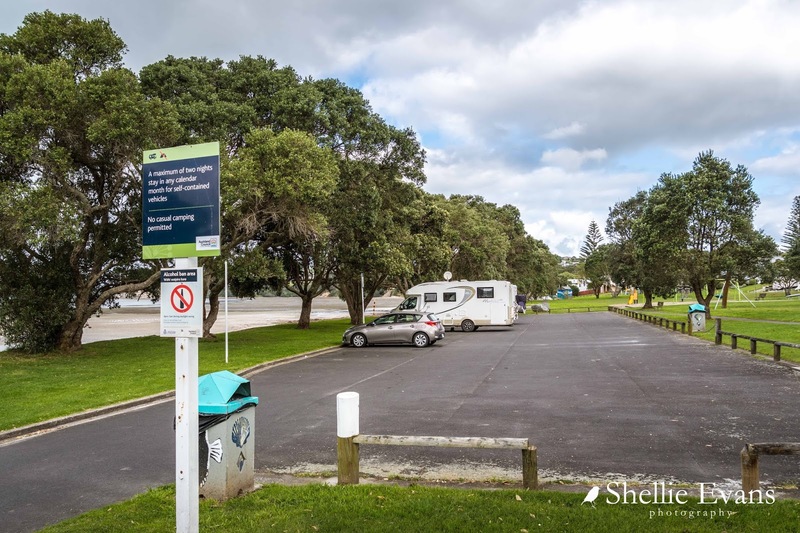 The park has several beaches and a lagoon along with a fairly large campground tucked in behind sand dunes; this camp is another one that has a 8 metre size restriction- I'm guessing because of the narrow road in and sharp drop down to the park. 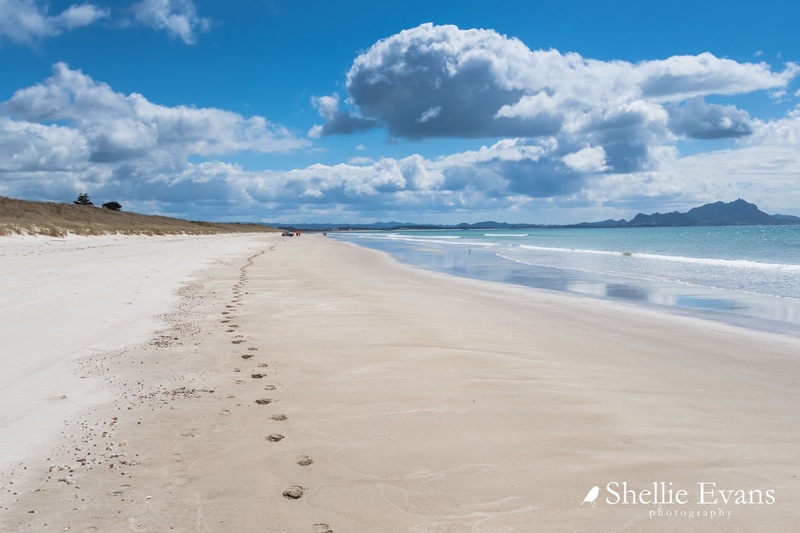 A marine reserve also borders the northern boundary of the park. 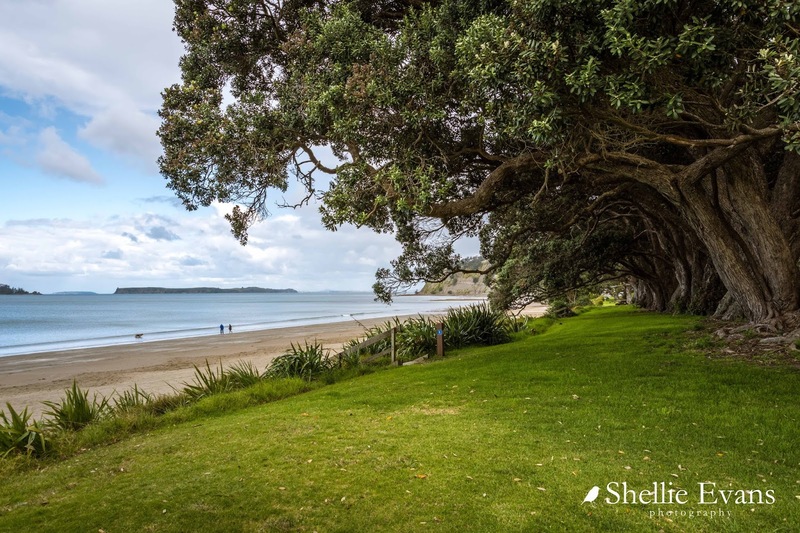 There are several walks over the headlands, around the lagoon and along the beaches. 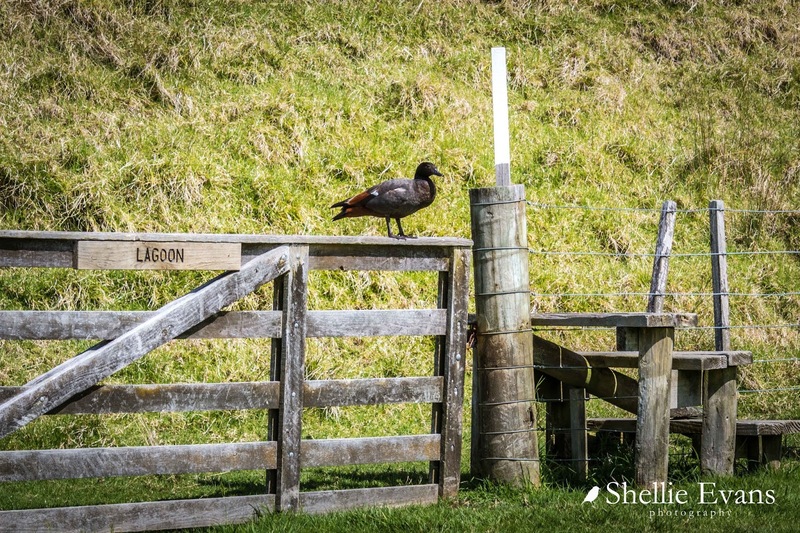 We walked along the boardwalk around the end of the lagoon until we reached this noisy fellow, a male Paradise Duck/Putangitangi (can he read?). Paradise Shelducks like to rest on high spots, some even high up in trees. It's likely he was warning his mate that we were approaching, she would have a nest somewhere near by in the reeds of the lagoon. 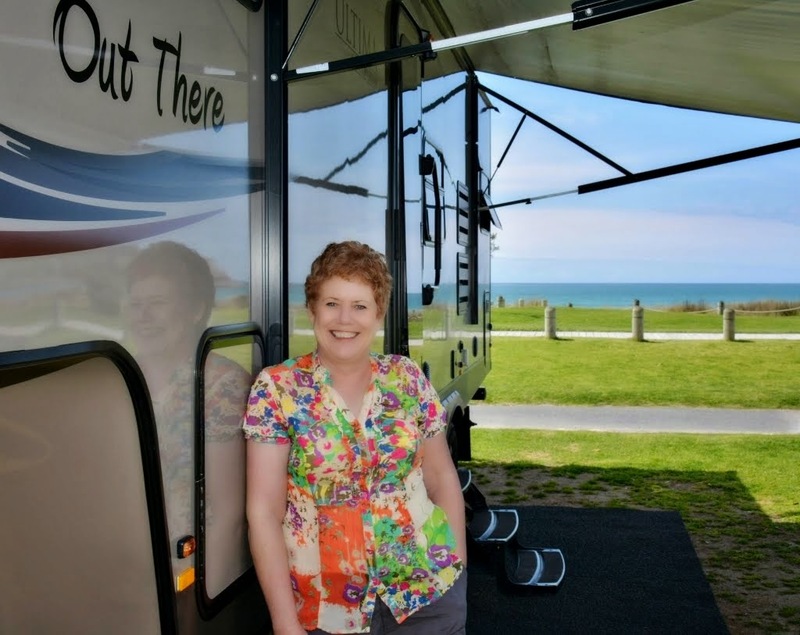 From our base at Sandspit we explored some of the Regional Parks that we couldn't visit with the rig on the back. 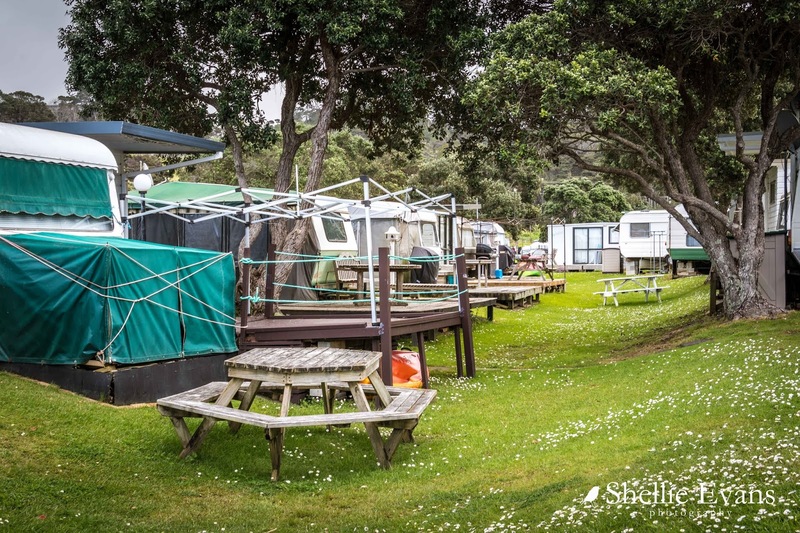 Some of the camping grounds were closed due to ground conditions, others closed for winter and a couple had a size restriction. 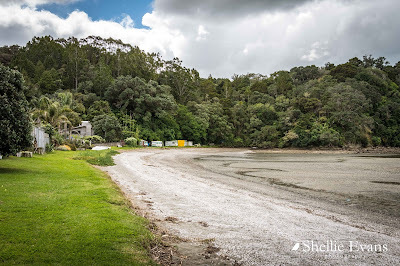 Our first stop was back down SH1 at Wenderholm Regional Park which is just north of Waiwera off the Hibiscus Coast Highway. 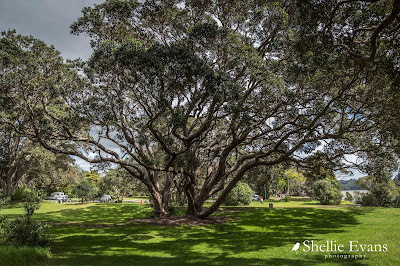 Many people will be familiar with Wenderholm, it's a peaceful oasis for a rest or lunch stop as you're heading in and out of Auckland. Although it's probably not so busy now that Northern Gateway Toll Road has by-passed the Park. There are many huge pohutukawas in the reserve and quite a number of historic trees, some were gifts to the owner from Sir George Grey (Governor of New Zealand) and planted as early as the 1860s. Auckland politician Robert Graham was the first European owner in 1868 and built his homestead Wenderholm (winter home) here so that he had somewhere to stay while he spent time at his Waiwera thermal resort in winter. 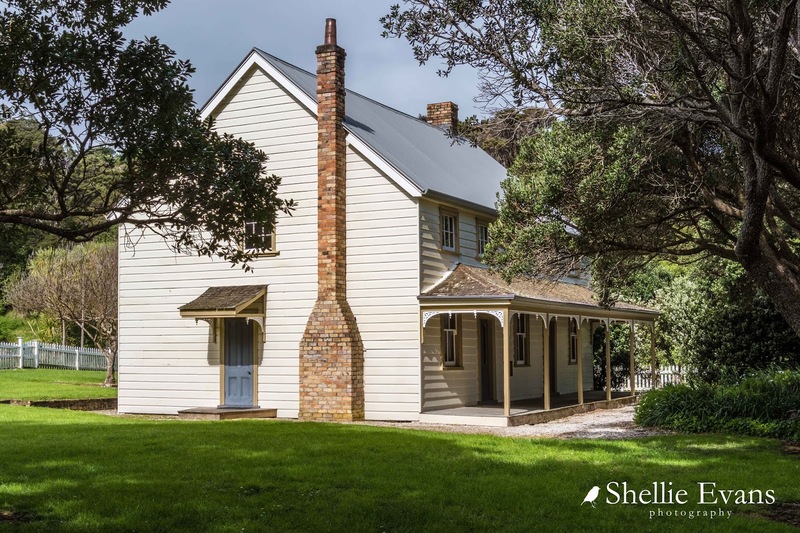 The house is now known as Couldrey House after the last private owner. From Wenderholm we headed back up the road a few kms and onto the Mahurangi West Road which winds it's way along a ridge out to the coast. 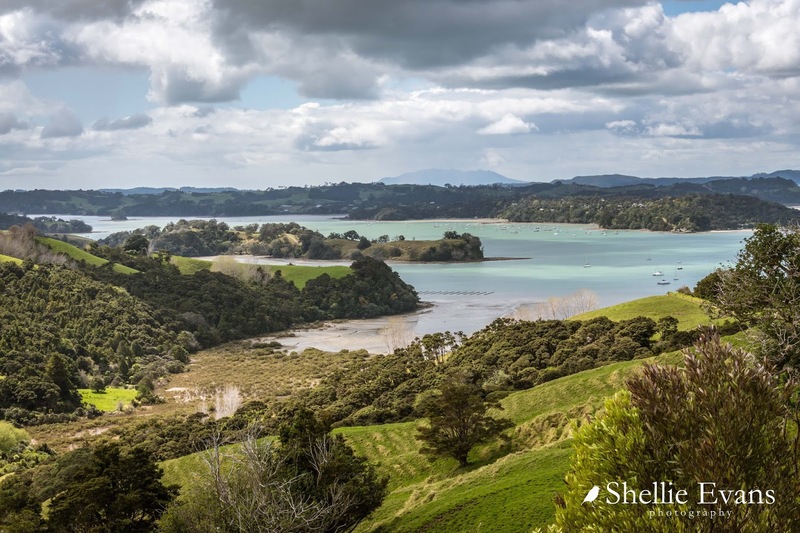 The Puhoi River separates Mahurangi West from Wenderholm. This is looking north east over the Mahurangi Harbour, much of the land across the water is the Mahurangi East/Snells Beach peninsula. 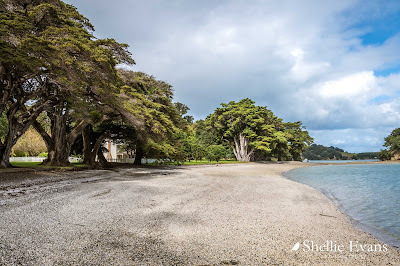 At the end of the road we drop down into Sullivans Bay (Otarawao Bay) part of the Mahurangi Regional Park. The park is divided into three fingers; Mahurangi West, Scott Point and Mahurangi East (which is only accessible by sea due to it being landlocked). 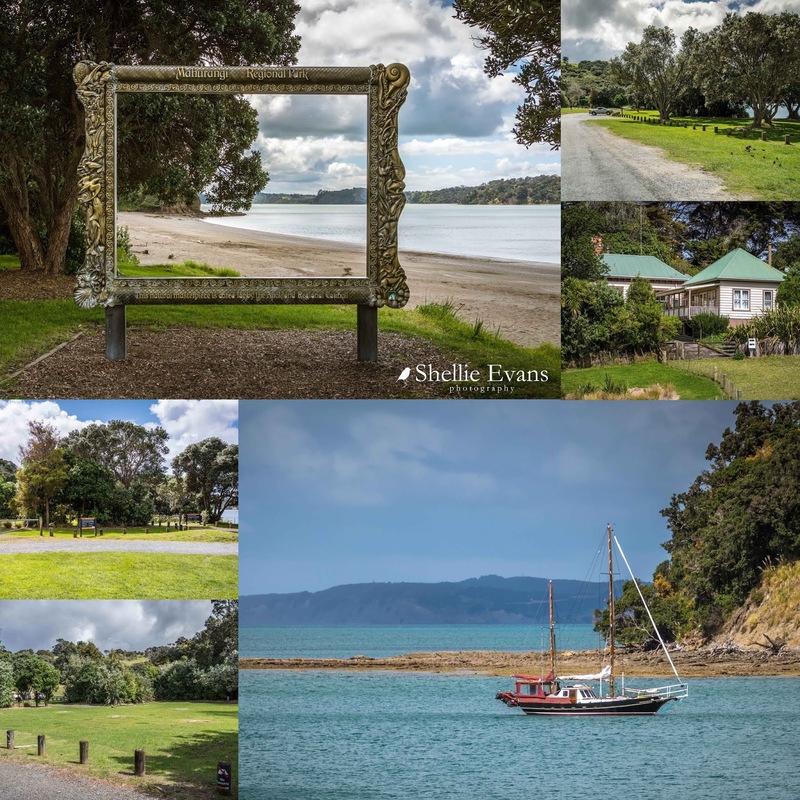 The Park straddles the large and sheltered Mahurangi Harbour. 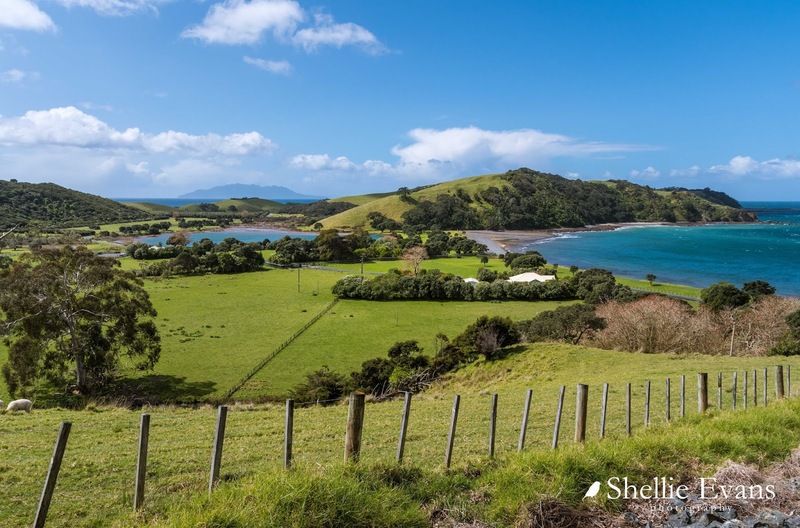 Maori lived here in large communities and there are several fortified pa sites on strategic points around the reserve. A sea captain, John Sullivan, married a local Maori woman and settled at Sullivans Bay in the 1870s. 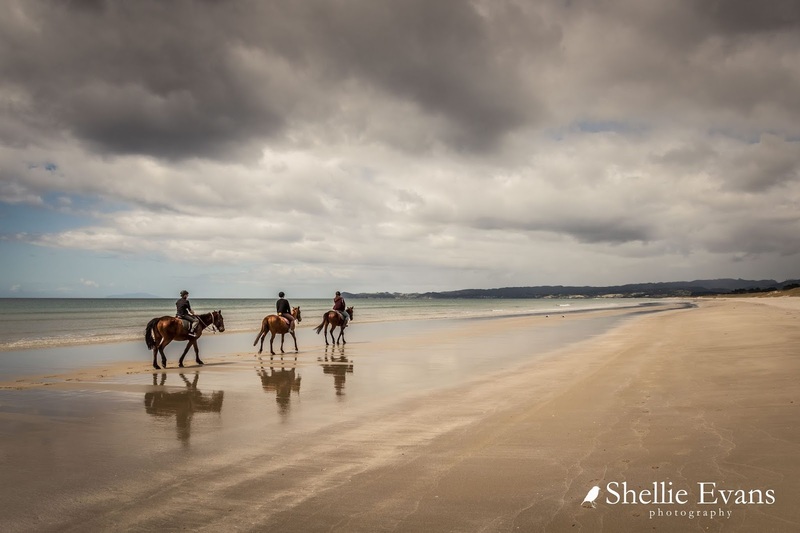 Their descendants farmed the land for nearly a century and farming continues today. 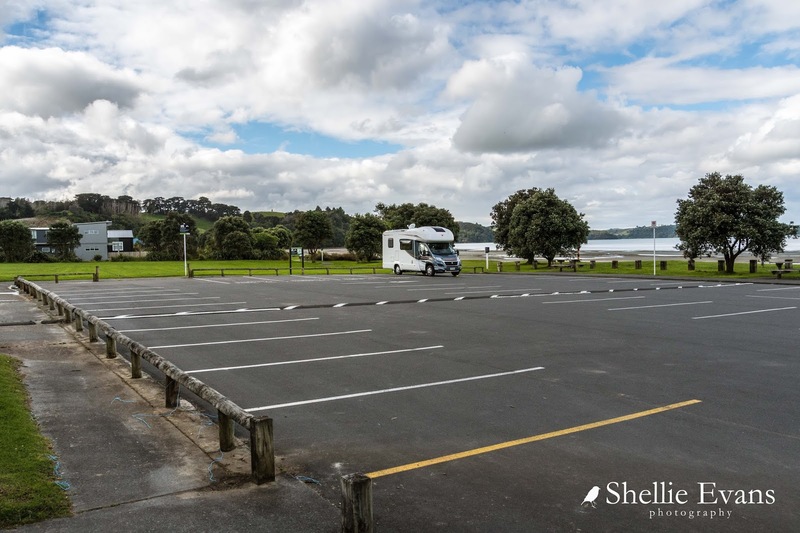 There is also a small campground in the bay for tenting and RVs under 8 metres (two photos, bottom left). We have a debate between ourselves quite regularly; is the 8 meters the length of your rig or the length of your van without tow or towed vehicles? I'll leave that for your conscience to decide. 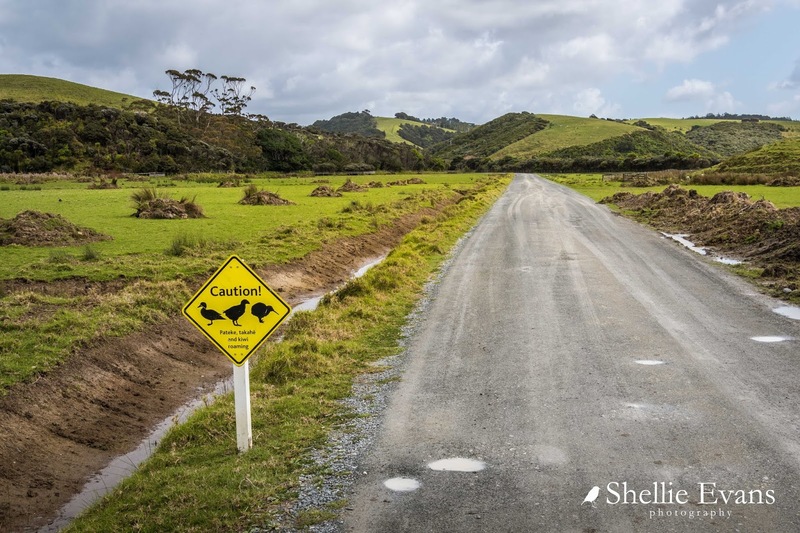 The road in is narrow and there are a few blind corners but nothing we wouldn't drive cautiously. As we drove into the car park we spotted ahead of us, lots of little black dots resting on the tarseal, spread from one side of the road to the other. At first I thought they were sun-baking sparrows and they'd fly off as we approached but no, they stayed put. ...and then down into tiny secluded Opahi Bay which is just around the corner from Sullivans. 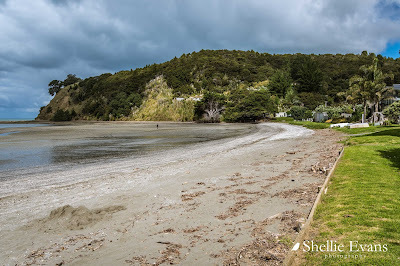 We had lunch on the foreshore, surrounded by baches and holiday homes, many of them hanging off the steep sides of the gully. 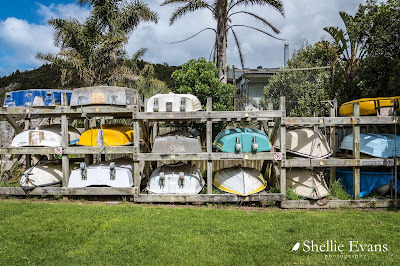 I loved the dinghy rack beside the reserve; tenders for the dozens of yachts at moorings further around the point. 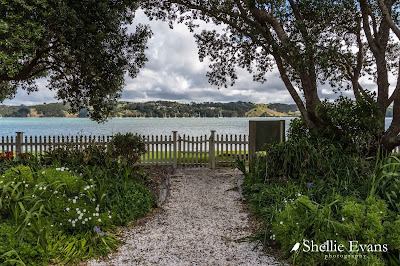 There was an old urupa (Maori cemetery) at the end of the bay, Ophai Bay has one of the pa sites mentioned earlier and much of the waterfront is Maori Owned. We see so many old caravans on our travels, but this 'Super Freight' slide on is a new one on me. It looks like these are now play rooms for the grandkids perhaps. 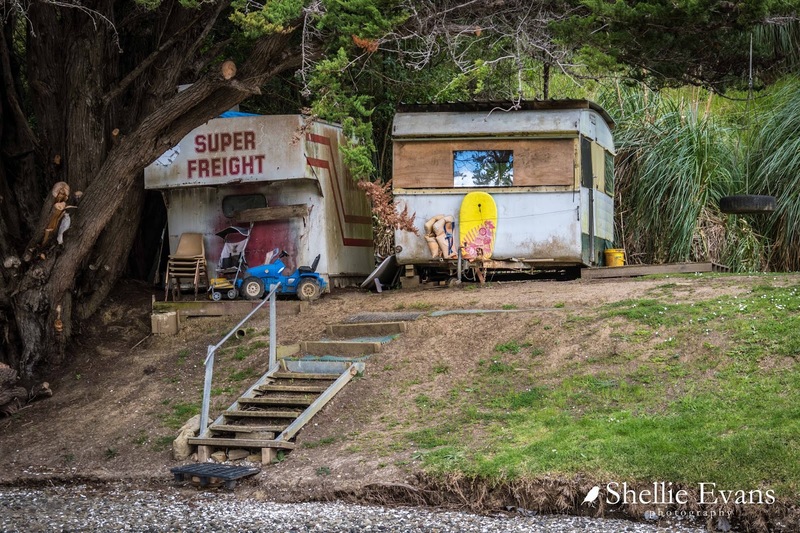 At the other end of the bay, tucked in under the overhanging bush, and not likely to have seen the sun in years, is a small collection of caravans that have seen better days. I guess families have holidayed here in summers past but going by the sorry state of them now, they'd need a lot of work to get them even slightly habitable. Pitching a tent would probably be a better option!